Most times, when we learn about history or watch a film about that very topic, we always are from the outside looking in. Then, when a film that does the very opposite comes along, it's a gem! And that is the case with “Downfall”, Germany’s submission for this year’s Academy Awards, which lost out to “The Sea Inside”. There have been a number of films that have depicted Hitler’s rise but none so dictating his fall. “Downfall” is that film. It shies away from elaborate war sequences and concentrates on the deterioration of the human psyche, marred by the horrors of war. In this two and a half hour spiral, Bruno Ganz portrays Adolf Hitler so chillingly that the audience can feel both disgusted yet sympathetic with the man. While we gape at the atrocities of his actions on other human beings, we might also find some compassion about a man who might just have been bent on achieving his dreams. Yes, you might already know how it all ends, but Oliver Hirschbiegel tackled a sensitive matter alongside screenwriter, Bernd Eichinger and that has made the difference because at the end of the day, someone had to tell the real story. And I must say the Germans should be proud that they both gave the film the right treatment. While most war films tend to focus on the battlefields, “Downfall” takes the viewer into Hitler’s personal life, his room, his friends, what he eats, the bunkers, the barracks and the hardest thing of all, into his heart. Like placing a magnifying glass over an ant with the sun shining brightly, witness the torturous civil war Hitler battles as he succumbs to his downfall. This Code 3 DVD has an insightful “Making Of” featurette. 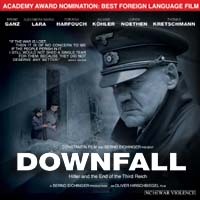 Like the film itself, the featurette ventures into the heart of the film by explaining the origins of Downfall. There are also interviews with most of the cast members as well as the director and playwright. Learn from the director and playwright how their vision materialized into Downfall and watch Bruno Ganz give his take on playing what could be the role of his life! There is also an “Interview” section on the DVD which is actually a vignette of all the interviews that can be found in the “Making Of” section. This is for those who want a quick summary of the conceptualization. The DVD comes in German Dolby Digital 2.0 and 5.1. Keeping true to the period where debris and dry blood filled the streets of Germany, the film is mainly depicted in grayish shades and dark blue tinges.